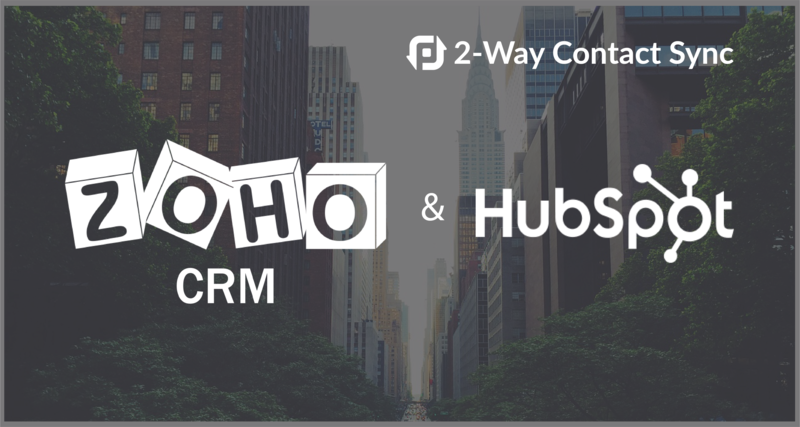 The Zoho CRM and HubSpot integration is a common used sync. Everyone likes to work with the best of breed apps. For example, marketing wants to use HubSpot and sales choose to work with Zoho CRM. Each app has their specific qualities that work well for those teams. PieSync can integrate these apps so that together they are a killer lead gen stack. This recipe is especially useful for CRMs that don’t treat leads differently from prospects or other contacts. With these guidelines we aims to showcase the power of PieSync for streamlining the marketing lead qualification process. We invite you to get in touch if you want to explore some options. Firstly, choose HubSpot to start a sync with Zoho CRM. Then create this rule to make up this sync: IF a contact in HubSpot is greater than 5 THEN sync the contact to Zoho CRM and add Tag “MQL”. In essence this reads when a HubSpot contact’s lead score goes over a certain threshold (in this case 5, but you can choose), then PieSync syncs this contact to Zoho CRM and adds a tag indicating that it is a marketing Qualified lead. You can also assign those Marketing Qualified Leads to a dedicated Zoho CRM sales rep through a filter. Instead of choosing “add a tag” select “set Owner to” and choose your rep from the drop down menu. TIP: Keeping GDPR in mind, syncing & storing opt-out preference on a CRM level is a must. With the Hubspot to Zoho CRM sync, you’re able to sync HubSpot’s analytics to Zoho CRM through PieSync’s customizable field mapping. First, create the custom fields you need within Zoho CRM, such as when did they last visit your website, and what was the last marketing e-mail they opened from you. On the PieSync dashboard you can map those custom fields between HubSpot and Zoho CRM, so that this information is synced to Zoho CRM from HubSpot. You only need to link these fields once, and you’re all setup! Good to know: Setting up a sync between HubSpot and Zoho CRM syncs historical website activity too! Thanks to PieSync’s Teams features, you and your colleagues can sync contacts from HubSpot into Zoho CRM (and vice versa). Duplicates (where the same contact is synced multiple times) are prevented because PieSync first checks to see if no similar contacts have been synced based on email addresses.